Coming into Weymouth station, it is possible to see a branch line that goes off through some grassland and past some retail units. From the main road, it is possible to pick this line up and follow it. Congratulations, you’ve just found the Weymouth Harbour tramway. The line goes through the road and follows it down to the quay. So when having a day out in Weymouth, Hedgie and I did just that. The walk was of a reasonable length, passing through something that closely resembled a platform before finally arriving at an old ferry terminal on an actual platform. 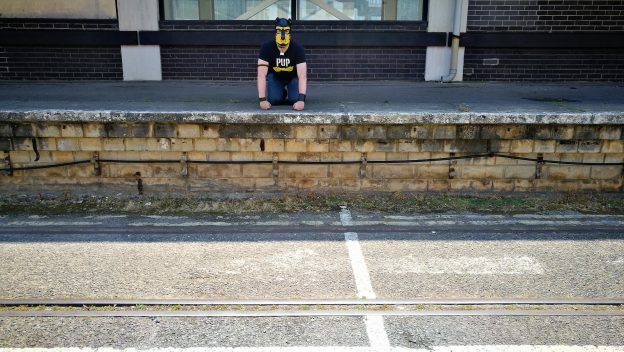 The platform itself was truncated, and you could tell that the rails used to go on a little further for a run-around loop, but there was no mistaking the station itself. This required pupping. So, directing Hedgie as to what the shot should be, I got into position and we got the shot. Afterwards, we were approached by a couple who had been following us, thinking we knew where we were going. We had a bit of a chat and I relayed some of the history of the line, and what PupAllTheStations was about. The ferry terminal was an old BR, and later Condor Ferries (no relation), terminal which was closed in 2015 after the ferry company acquired a larger vessel and the council were unwilling to undertake work to expand the harbour. Trains to the terminal had ceased in 1987 but the ferry had continued on. Looking inside the windows we could see old chairs and abandoned office junk. There was very little evidence of its former glory. We then went on our way and “enjoyed” the rest of Weymouth (read the blog post to see more on that). There is a campaign to bring the tramway back into use in some sort of Heritage capacity. Click here to visit the Facebook group for it. You can also look below to see footage from the last train to run down the line: a chartered special in 1999.